There seems to be quite a buzz surrounding the next generation Google smartphone, a device coming from the LG camp and currently know as the LG Nexus. 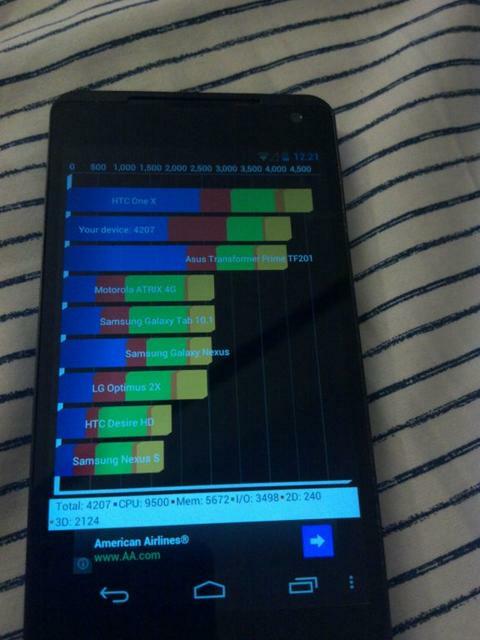 We have already been treated to several leaks on the Android smartphone’s specs and even a few images, and now it appears that the LG Nexus has been put through a couple of benchmarks. According to an article over on Ubergizmo by way of Mobile Geeks, an LG smartphone prototype has somehow found its way out of the lab, which is presumed to be the aforementioned LG Nexus handset, and been put through Quadrant and AnTuTu benchmarks. Apparently the word is the person that owns the prototype has owned the device for roughly half a year, so probably means the device is a pre-production handset along with pre-production software aboard, something that might explain why the device isn’t doing too well when you consider the handset is rumoured to sport a 1.5GHz Snapdragon S4 processor. In the image you will see that the device is lower than that of the HTC One X with Tegra 3, but then again obviously if the device is a pre-production prototype then that is probably to be expected, as previous benchmark test show that the I.5GHz quad core processor does outshine anything else available. Earlier today we reported that the LG Nexus, now apparently being touted as the LG Nexus 4 is expected to be unveiled on the 29th of this month, although that date hasn’t actually been confirmed. So there you have it, if all the LG Nexus rumours pan out it shouldn’t be too long before we get all the juicy confirmed details on the device, along with newer benchmarks of course. Is the LG Nexus the Android smartphone that excites you over any other?